A few days ago while idly thumbing through my first book (published 1988), I ran across a list of hunting tips. Soon I began thinking, "Hey, these are still great tips." I'm sure those who took these tips to heart back in the '80s enjoyed many years of exceptional deer hunting. Today, of course, a whole new generation of deer hunters follows in their footsteps, and likely, most of these new hunters have not heard of these tips. So, if your hunting success does not match that of your father, uncles or grandfathers (often related by them), these old tips may be just what you need next fall or now [Originally published in December.] if you plan to hunt during late-season muzzle-loader or archery seasons this year. Here they are with a few modern updates. Tip #1: Never waste time at a stand site where you cannot point to one or more solid reasons for being there: fresh tracks, droppings, bed, ground scrape, favorite foods freshly fed on, water, a trail hub, a crossing, etc. The more reasons you can list, the more productive your stand site will be. Tip #2: Never rely on a single stand site. If some foolish hunter wanders up to your only stand site and begins talking to you, sits or voids just over the next rise or alarms a deer near your stand, causing it to bound away, tail up, spewing long-lasting danger scent from its tarsal glands, you are likely to have a boring hunting season. Before the season begins prepare three to five stand sites, all with different values, anticipating changes in wind direction, changing whitetail foods (from graze to browse), changing phases of the rut and effects of other hunters. Tip #3: The two most productive hunting hours of the day are the first and last shooting hours. To get the most from them, get to your stand site before first light in the morning (one hour before sunrise) and remain at your stand site until dark in the evening (until 30 minutes after sunset). Tip #4: When walking to or from your stand, especially while within 200 yards of your stand, pick up your feet and set them down lightly. Don't stop along your stand trail. Don't leave your stand trail. Don't act as if hunting. Act as if you nothing more to do but check on a tree in the next township. 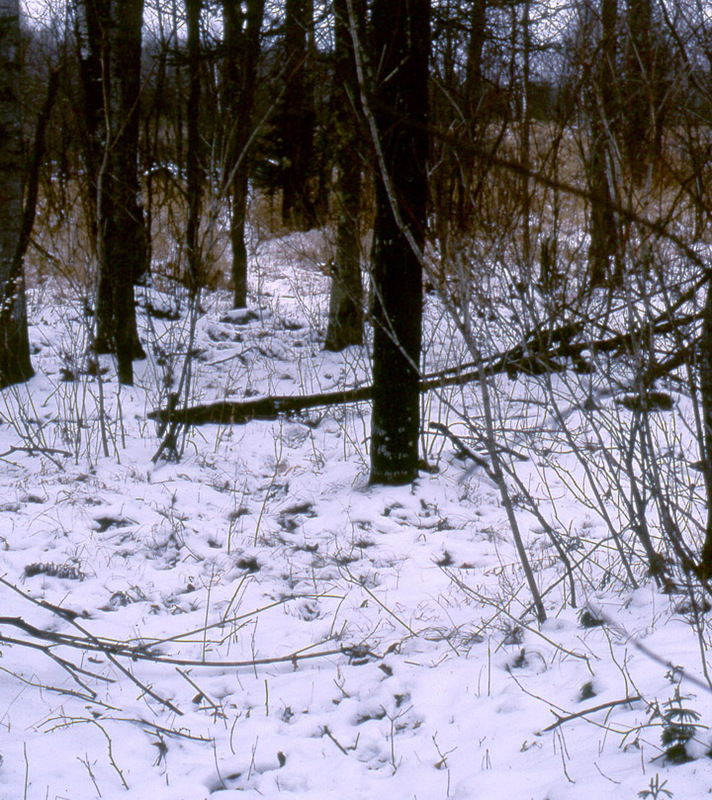 Moving in this manner, whether unseen whitetails along the way identify you or not, they will not consider you or the sounds you make to be dangerous. Before you are near, deer along your path will simply move aside, freeze in cover, wait for you to pass and then resume whatever they were doing before you interrupted them. You'll see more unsuspecting deer near your stand site. In fact, the more times you do this, the better it works. In time, some deer may even follow you to your stand. If you move along your stand trail in any other manner, triggering higher stages of alarm (tail-up flight, snorting, etc.) your odds of seeing deer near your stand will be very poor. Your odds of taking an experienced adult deer while hunting on foot are only about one-in-60. At your stand site (every precaution taken) your odds will be one-in-four or better. Never ruin your chance of taking a deer by acting as if hunting when hiking along your stand trail. Tip #5: Take along a sealable plastic bottle or a plastic bag and tie to use as a porta-potty so you be forced to leave your stand during a productive time period. Tip #6: Never smoke at your stand. Never wear clothing contaminated with tobacco smoke at your stand. Experienced adult whitetails instantly identify humans reeking with this unique odor. When your neighbor has a fire in his fireplace, even while the smoke is rising straight up you can still smell smoke at ground level. The reason is, invisible pungent smoke molecules drop like snowflakes to the ground. When you emit tobacco smoke molecules, greater height above ground provides no protection from whitetail noses. Whatever your height, experience adult whitetails will readily smell and identify you along a line 400 yards wide, 200 yards or more downwind. If you or someone else in group smokes, remove your outer hunting clothing at the end of the day of hunting and store it safely away (sealed in a plastic bag, for example), before anyone lights up. Tip #7: Be as "low profile" as possible. While sitting quietly on an elevated platform (or on a stool on the ground), your odds of being identified by a deer are about 15 times less than while moving about on foot. The trouble is, you must move on foot to get to a likely spot to sit. Your success at your stand site will largely depend on your ability to avoid detection by deer, positive identification, or at the very least, tail up stages of alarm. Once an experienced adult buck pegs you as a dangerous human while on your stand trail or very near your stand, it will likely avoid the vicinity of your stand trail or stand the rest of its life. By example, it may even teach younger bucks to do the same. Wash all of your hunting clothes with laundry soap free of scents and color brighteners. Hang your clothes outside to dry. Clean, waterproof (if necessary) and hang boots outside one to two weeks before hunting. While hunting, wash your body often with scentless soap. Change your underwear and socks daily. Brush your teeth with soda. If a firearm hunter, wear camo-blaze-orange. Cover all exposed skin, a camo mask or head-net on your head, cap on top, and camo gloves on your hands. Tip #8: Use a cover scent. This tip was written during the 1980's when certain cover scents such as fox urine actually worked. After spraying boots with the pungent stuff, whitetails acted as if the detected no human odors on trails or at stand sites recently trod by humans. Deer often followed human trails laced with this heady odor. By the end of the 1980's, however, it was becoming obvious many adult whitetails were no longer fooled by these much-used scents. The absolute best way of avoiding being smelled and thus identified by all whitetails is to approach all stand sites or trails or areas currently frequented by deer from downwind or crosswind and sit downwind or crosswind. Tip #9: Use a portable tree stand. Portable tree stands are marvelous hunting tools once they are in place. None I know are even remotely marvelous, however, between shouldering one in camp and stepping onto the platform up in a tree. It's a perilous journey during which at any moment a horrendous metallic rattle, clatter or clunk may ruin the day. It takes plenty of padding, strapping, tape and practice to master a portable. One way to considerably enhance the probability of a silent setup in the predawn hush of opening morning is to make dry runs to selected stand sites two to three weeks before the opener, a time when accidental clatters will be of little consequence. Preparing the trees you will use, trimming branches, installing steps [if legal in your area], and gaining familiarity with likely pitfalls will greatly improve the likelihood Old Mossyhorns will saunter up on opening weekend without the least suspicion. Tip #10: Nine or ten feet above the ground is high enough for a portable stand. All other things equal, hunters using tree stands 50 feet above the ground are not more successful at taking deer than hunters nine feet above the ground. All the higher hunters are likely to get more of is vertigo, motion sickness and more deadly falls. The thing that makes one elevated stand more productive than another is natural, human-silhouette-hiding cover at the platform level. Nine or ten feet is sufficient if you position your portable among dense boughs of evergreens or branches of trees heavily covered with leaves. Never trim off boughs or branches behind where you plan to sit. Never leave yourself sky-lighted. Regardless of what you wear, when sky-lighted your silhouette will be black, readily spotted and identified by today's experienced adult deer while still great distances away. Tip #11: Prepare to hunt long hours during inclement weather. Some of the most productive hunting hours occur when most hunters would rather be in camp playing cribbage. Tip #12: Be patient. Whereas my hunting partners and I generally change stand sites every half day, it is nonetheless difficult, often even agonizing, to sit still and remain alert at a stand site five to six hours at a time. Way too many times I have wished I had remained seated one or two minutes longer, then finding myself standing there listening to the fading hoof beats of a huge buck the unexpectedly appeared a short distance away when I stood up to go and then disappeared before I could raise my rifle or bow. Patience is the art of making yourself stay put a little longer, over and over again. It's the art of selecting clothing that will shield your body from numbing cold, rain, snow, wind and biting insects. It's the art of providing yourself with a seat that will not soon torture you with unbearable discomfort. It's the art of keeping aching or stiff muscles and joints from forcing you to stand up and stretch. It's the art of denying relief for hunger, thirst and a full bladder. It's the art of convincing yourself some other stand site would not be more productive during your planned remaining hours at your current stand site. It's the art of remaining alert, considering the source of every little sound, especially soft twig snaps. It's the art of convincing yourself to wait ten minutes longer, whether some part of your body can no longer endure whatever it is enduring or whether is it actually time to head back to camp. More than anything else you might do, patience of this magnitude will make you a regularly successful buck hunter (or regularly successful at taking antlerless deer as well).